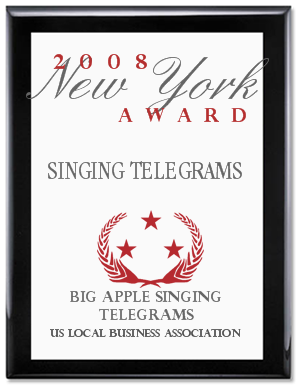 About us – NYC singing telegram New York City, New York. Featured on an upcoming episode of “Star Treatment" on A&E, this show will feature service industry who cater to star clientele. WE JUST APPEARED ON FOX 5, “GOOD MORNING NEW YORK" VALENTINES DAY SEGMENT! Also on WABC 7 with Diane Sawyer, Oxygen network, Access Hollywood, CNN with Anderson Cooper, MTV, New York Observer, Law and Order, Client referrals include, UBS, Credit Suisse 1st Boston, Morgan Stanley, Bear Stearns, Merrill Lynch, American Express, The Public Theatre, Penny Marshall, Comedy Central, NY Jets, NJ Nets, Diane Sawyer, Dianne Carroll, Drew Barrymore, Bobby Short, George C.Wolfe, Leona Helmsley, Larry King, Quincy Jones, Robin Leach, Le Cirque Restaurant, Four Seasons Restaurant, Trump Plaza and many, many more!!! Est. 1979, Manhattan. 24 years of “Guaranteed Laughter!" Gorillas, French Maids, Elvis, Marilyn and Sinatra, We have them all! “Shipley has performed as Elvis, a chicken, a pink gorilla, and even a UPS man in the midst of million dollar deals on the New York Stock Exchange floor… sometimes goes out as a humorous and silly singing cop… because “people love the handcuffs and often want to keep them." “Thank you sooo much!!! That was the first time I've ever received a singing telegram (and probably the last). You are awesome."